You will Visit some of the New Orleans most iconic neighborhoods. French Quarter, Garden District, Uptown/Carrolton, Mid-City, and the University Area. Your guide will explain the diverse history of the city and architectural styles of the unique buildings as you travel through the neighborhoods. 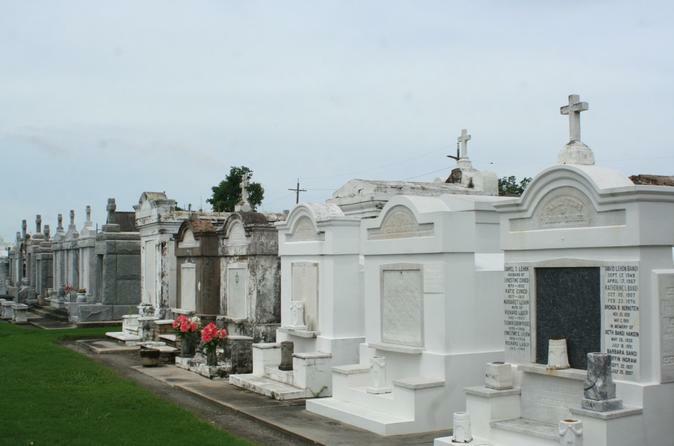 Walking through some of the quintesential cemeteries while in the French Quarter, Garden District, and Mid-City you will come to understand why they are known by the nickname of "Cities of the Dead. " Starting times for the tour is available between 8 A.M. and 12 P.M. Please leave requested times in the special request section during booking. Unless customized the tour will typically start with a brief tour of the View Carre, or "Old Square", the Original City, as well St Louis Cemetery #2. We will then head upriver to the "American Sector" know as the Garden District to take in the sites of some of cities most elegant and historically significant residences. Laid out in 1806 the Garden District was "one of the earliest expressions of the Greek Revival to appear in New Orleans. Many of the streets still bear the names of the nine muses of Greek Mythology. We will ride through City park and make a stop at St Louis Cemetery #3 before finishing up at the drop-off location.